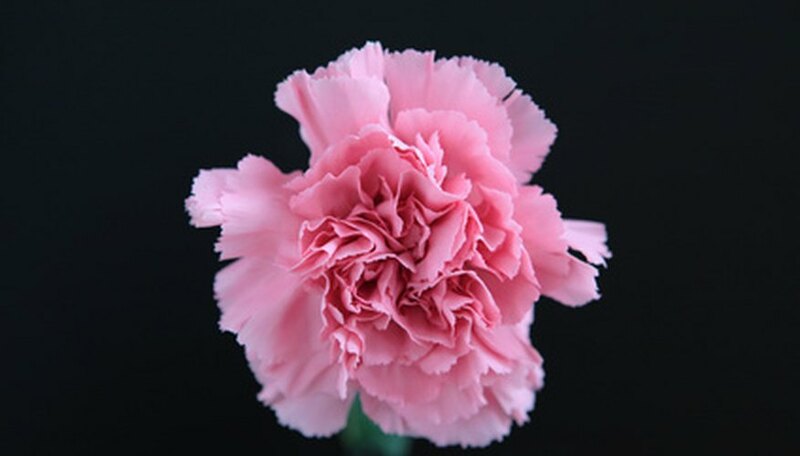 Dianthus is a genus perhaps best known for carnations. Other well-known members of the genus include Sweet William and pinks. The many different Dianthus types bloom in many colors. Some, like Sweet William, are scented. Grown in the ancient world by both Greeks and Romans, Dianthus traveled through Europe then on to the U.S. For members of the genus like the carnation, all this cultivation has made it difficult for some pollinators to reach the internal parts of the flowers to collect pollen. These have to be reproduced with human help. Sepals are one of a maximum of four parts that any flowering plant can possess. Flowers in the Dianthus genus do possess all four and so are considered "complete." In complete flowers, sepals are at the bottom of flowers, between the petals and the stem. Collectively, sepals are called a calyx. The calyx forms a cup that serves as a pedestal for the rest of the flower. Before a flower opens, the calyx protects the bud. The sepals of Dianthus flowers tends to be green. As complete flowers, members of the Dianthus genus do have petals--sometimes only a few and sometimes many. Carnation cultivars--cultivated varieties--might have as many as 40 petals. Petals, like sepals, also protect the inside parts of the flower. They're not strictly necessary for reproduction, so sepals and petals are both known as accessory parts. Collectively, the petals are known as the corolla of the flower. The petals of a Dianthus flower do much more than protect the inside of the flower. The petals are showy and scented to attract pollinators. They are frilled on the edges or look "pinked" as if by pinking shears. The color pink comes from the color of the "pinked" flower of Dianthus. In complete flowers, the last two parts as you move inward are the male and female parts of the plant. Possessing both reproductive parts as a complete flower, blossoms of the Dianthus genus are, thus, bisexual. Flowers that have both parts are also called "perfect" flowers. The male reproductive part of the plant is called the stamen. It consists of a filament that is topped by an anther, which produces pollen. Because some Dianthus types have been so cultivated over the years, they no longer produce much pollen. This is the case with carnations. The female part of flowers, the gynoecium, always sits at the center of the flower. It is composed of at least one carpal, usually fused into a single pistil. At the base of the pistil is an ovary that contains eggs. At the top of the pistil is a stigma, there to receive pollen. The stigma and the ovary are connected by a tube called the style. Sperm travels down the style to reach the egg. Though Dianthus is bisexual, most cannot fertilize themselves because the stigma isn't ready to receive the pollen when the anther releases it.